Facebook Messenger: A New Way to Sign Up For Androids: The Messaging application Facebook Messenger, has added a new way for users to register and start talking with your Facebook friends. The social network Facebook equipment allows new users to register only with your name and phone number, without having to log into Facebook. After rumors of a possible takeover of Whatsapp by Facebook, the social network team has released a new update for users, particularly for Facebook Messenger. In 2010, Facebook announced its own instant messaging application for mobile, linking the possibilities of the web version messages with a specific system for mobile. Facebook Messenger combines the conversations and messages from users of the social network in one place, including chats and emails. 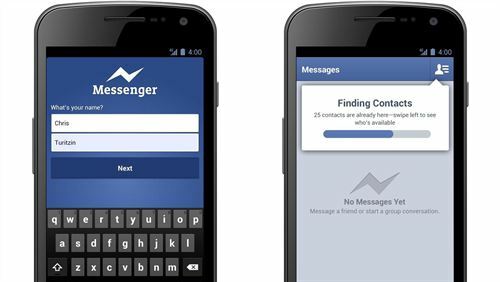 After several updates in recent years, the messaging service Facebook is getting closer to many other services for smartphones available, including Whatsapp. On Tuesday, the team of the largest network of Internet adds a new feature in the line of other instant messaging services. For those users who download the application will no longer have to login with your Facebook account, you can simply enter your name and mobile number. Registration will be similar to other applications through an SMS confirmation and after getting the address book contacts as Facebook says in its press site. By the time this new feature is only available for users of Facebook Messenger on Android devices from this Tuesday and, according to the social network, the new Messenger accounts will be available in the coming weeks for all users.